Enter the lane next to the Birds and Bees restaurant. 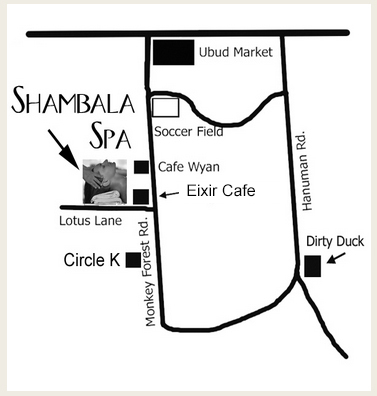 We are located between Starchild Spa and Nine Heavens Spa. Come to Rahayu Restaurant on Monkey Forest Road, across from the THREE MONKEYs Restaurant. Next to the Birds and Bees Restaurant, take the beautiful lane and walk 50 meters, beneath the cooling shade of the dark green pine trees. We highly recommend making your reservation by phone or in person. Due to our reputation, we are often booked in advance. Please make your reservation in advance in person whenever possible. We do ask that you give us a deposit, if you wish for us to hold your space.